Perfume: The Story of a Murderer – Jean-Baptiste Grenouille, born with a superior olfactory sense, creates the world’s finest perfume. His work, however, takes a dark turn as he searches for the ultimate scent. I love how this podcast gets us to watch amazing movies that we’d probably never watch otherwise. We never even heard of this one, but both enjoyed it very much. It’s two and a half hours long, but riveting the entire time. Highly recommended. This episode was suggested by Kevin K, and the beers were brought to us, literally, by That Bead Girl. 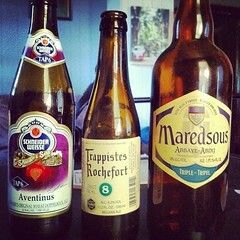 For this review we’re drinking Schneider Weisse Unser Aventinus (TAP6), Trappistes Rochefort 8 and Maredsous 10° Tripel.